Heat oven to 375°F. Unroll dough onto cutting board. Cut in half crosswise and lengthwise on perforated lines to make 4 rectangles. Press diagonal perforations to seal. Starting with long side of 1 rectangle, roll dough tightly into 6 1/4-inch roll; press seam to seal. Repeat with remaining dough rectangles. Spray thin serrated knife with cooking spray. Cut each roll into 16 slices. On ungreased large cookie sheet, place 32 slices about 1/2 inch apart. Place remaining 32 slices on second ungreased large cookie sheet. Bake 1 cookie sheet at a time 8 to 9 minutes or until slices are light golden brown. Top baked slices using all 8 toppings and making 8 appetizers of each, or choose your favorite topping options and make as many of each as you’d like. All toppings are quick to assemble, taking only about 4 to 8 minutes to make 8 appetizers. 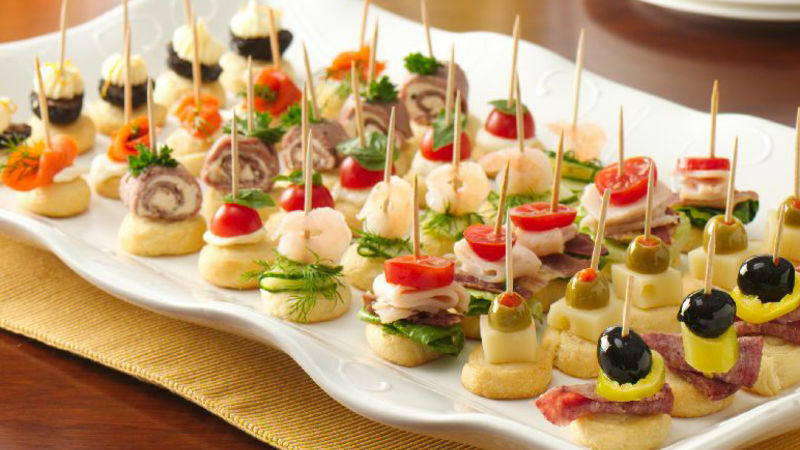 For a festive look, substitute fancy toothpicks with frills on the top for the plain ones. Be creative and mix and match any of the toppings above or add any favorite ingredient from your refrigerator.